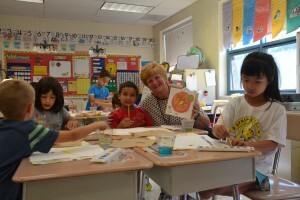 That was the message written in the room of Springville Elementary School’s first-grade teacher Jane Kitchen on Sept. 16 as she, her students, the rest of the school and students all around the world participated in activities to celebrate International Dot Day. Vashti hastily draws a single dot, which her teacher the displays for all to see. When Vashti sees her work displayed, she believes she can create an even better dot than she did at first, and so she sets off on a creative journey drawing all manner of dots in different colors, shapes and sizes. Vashti even goes on to inspire others with her work. “She thinks she has no talent but she has one talent and it’s drawing dots,” Springville first-grader Eric LaGrotta said. Students all over Springville participated in creative dot activities, including Kitchen’s students who did a painting activity. Each student was handed a blank piece of paper with a single dot already marked on it, and Kitchen then instructed them to use the dot and their watercolors to create a new picture with the dot as part of it. “Everyone can be a good thinker. Some people don’t even know they’re good thinkers, but you’re going to know that today, because you are going to make a picture out of this dot with your paints,” Kitchen told the students. Kitchen walked around the room as her students crafted their pictures. Some students used the dot as the head of a person, others chose to have their dot become the center of a flower or the sun, and some even combined colors to mask their dot. “That’s exactly what Peter Reynolds was talking about — thinking and being creative. That’s some thinking. He’s creating his own colors,” Kitchen said. Kitchen said school librarian Kelly Trace had been working with the story with classes in library all week long so the students could become familiar with it. “It’s about creating and celebrating creativity, inspiring and using talents and gifts,” Kitchen said. First grader Keira Oliver also said she understood the theme of the story. “It’s to celebrate your own talents,” Keira said. 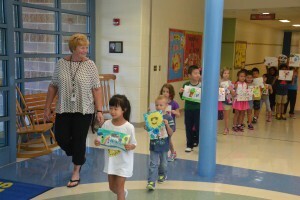 And Kitchen’s students certainly did celebrate, as when they finished their activity, they took their completed paintings on a “Dot Parade” through the halls and main office of Springville before returning to their room to hang up their first paintings of the new school year.